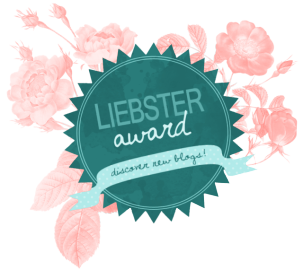 Lady (and boy) in waiting: The Alexcellent guide to stalking the royals. I got all caught up in royal fever during the recent Australian tour of the Duke and Duchess of Cambridge (and Prince squeezy-cheeks George). From the moment William, Kate and that cute baby on her hip descended the stairs at Sydney airport, I was hooked. Much to the annoyance of Spider Boy. But although Spider Boy thinks I’m such a fan, I’m obviously not THAT much of one because I couldn’t get myself organised enough to even catch a glimpse of the young royals, despite my being in two of the cities they were in at the same time as them. So for the sake of your own future royal-watching efforts, I bring you the Alexcellent guide to stalking the royals… or what not to do, if you actually want to see them in person. 1.Watch TV coverage of royal family arriving in Sydney and wonder if I should jump on a ferry and whizz over to the Opera House forecourt where their first public appearance is scheduled. Look at the crowds screaming on TV, feel tired and decide to stay put. 2. Think about squeezing Prince George’s cheeks and bonding with Kate about all the things we have in common. 3. Google Their Royal Highnesses royal schedule for Canberra, as Spider Boy and I are going to be in our Nation’s Capital when the royals are. What a coincidence. 4. 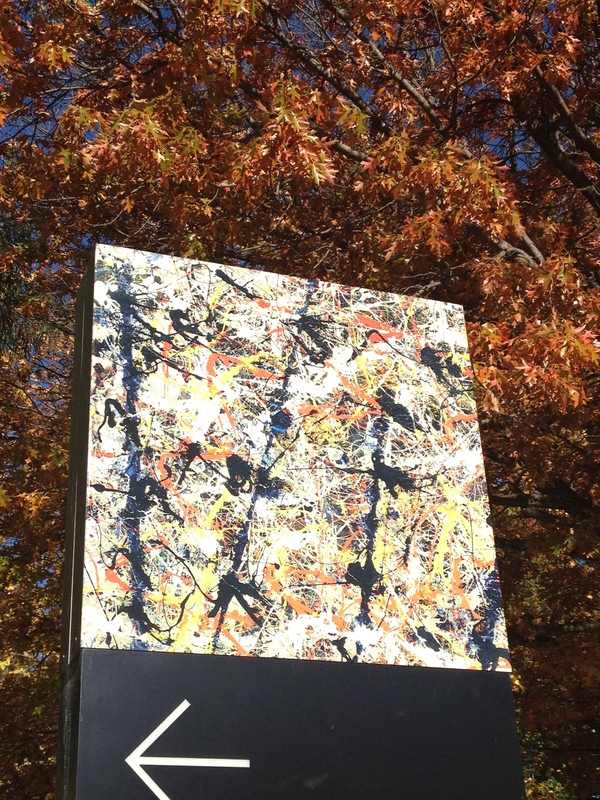 Become blasé about the plethora of options to see royals in Canberra. 5. 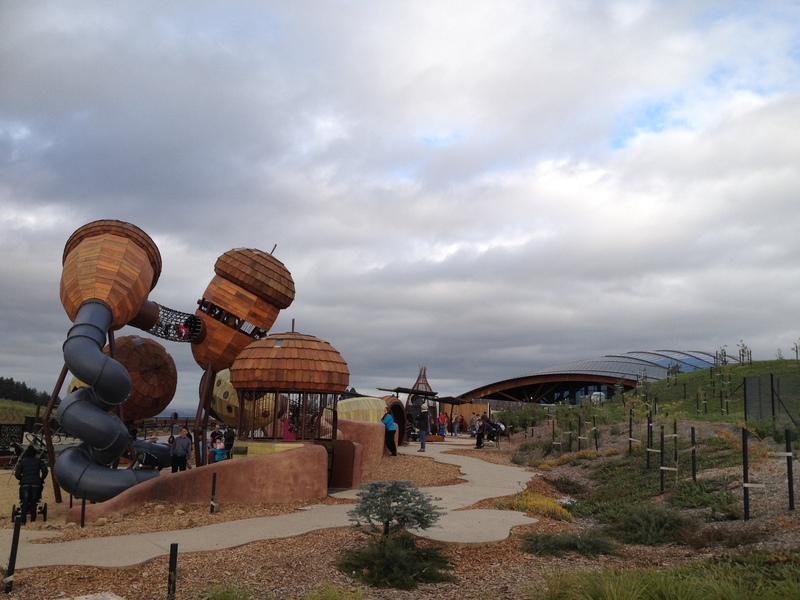 Once Spider Boy and I are in Canberra, allow blasé attitude to continue due to Canberra’s smaller population (less competition for standing room) and faster transit times between destinations*… so blasé as to think there’s no need to check appearance details or make any kind of plan. 6. Somehow forget that when planning to take public transport in Canberra, one needs to actually plan. No, there won’t be another bus along “in a minute”. 7. 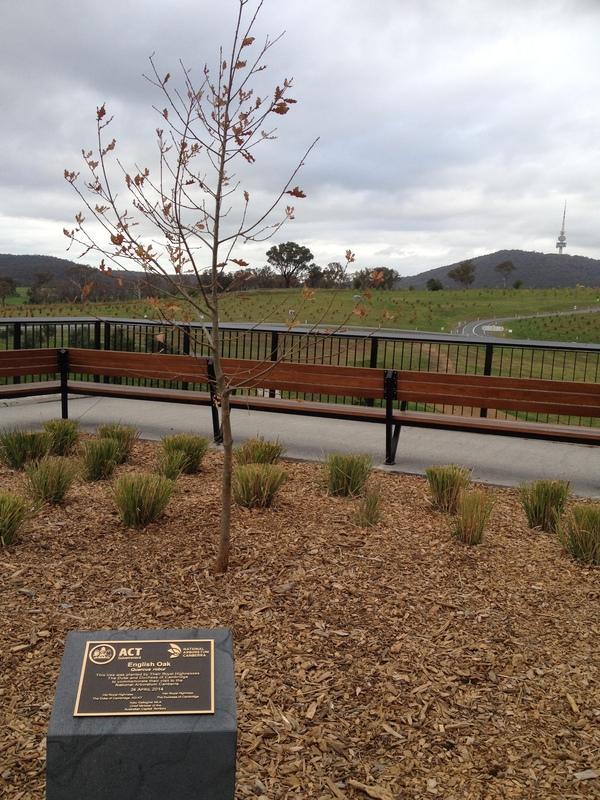 Realise that the National Arboretum appearance is not an option for me, as it is closed to general public. Only 50 Canberra families who were drawn in a ballot are attending. 8. 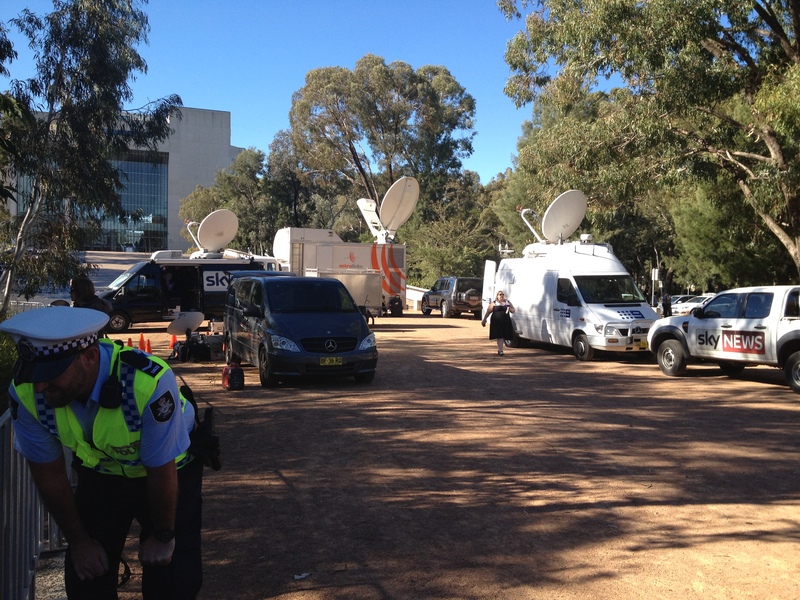 Think, no matter, there’s always lunchtime address at Parliament House. 9. Plan to get to Parliamentary zone on a bus “late morning/sometime around lunchtime” where we also plan to meet Spider Boy’s dad for lunch and play royal-watching by ear. 11. Walk along deserted suburban streets in direction of far-flung bus stop and think ” Ooh, I wonder if that’s our bus” as the 67 whizzes past. 13. Reach bus stop and call Action Buses, since the phone number is conveniently displayed on the bus stop sign. 14. Discover that I can wait 50 minutes for the bus that takes 10 mins to one interchange (yes, the 67! ), or wait 35 minutes to get a bus that takes 30 minutes to get to an interchange further away from my destination. 15. 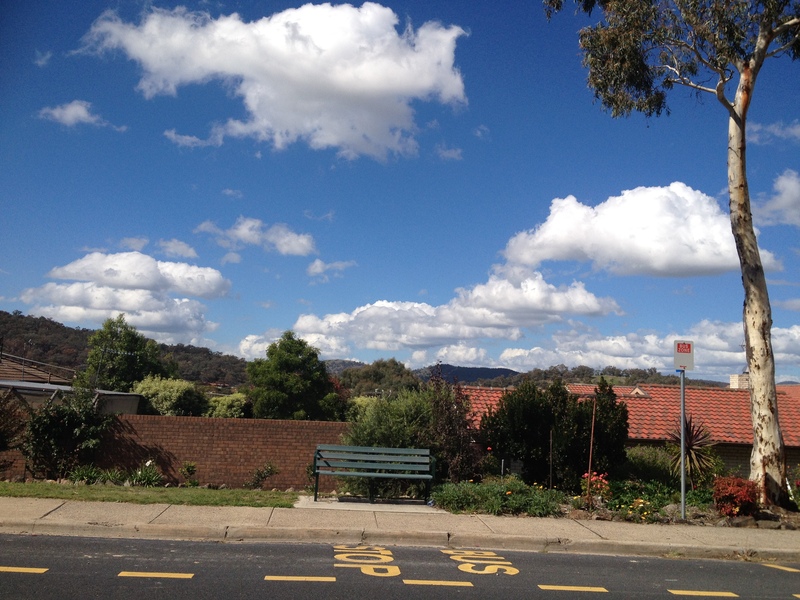 Wait 50 minutes at lonely suburban bus stop. 16. Stress silently over the possibility of not having enough phone battery charge left to take photos of royals, due to Spider Boy playing games on my phone while we wait. 17. Think for a split second that perhaps the two cars that pull up at our bus stop twice in 50 minutes are kindly offering us a lift. Not that we would accept. The female drivers are simply asking us for directions. 18. Eventually arrive in Parliamentary zone just after 1pm. Look at Parliament House from the bus window. 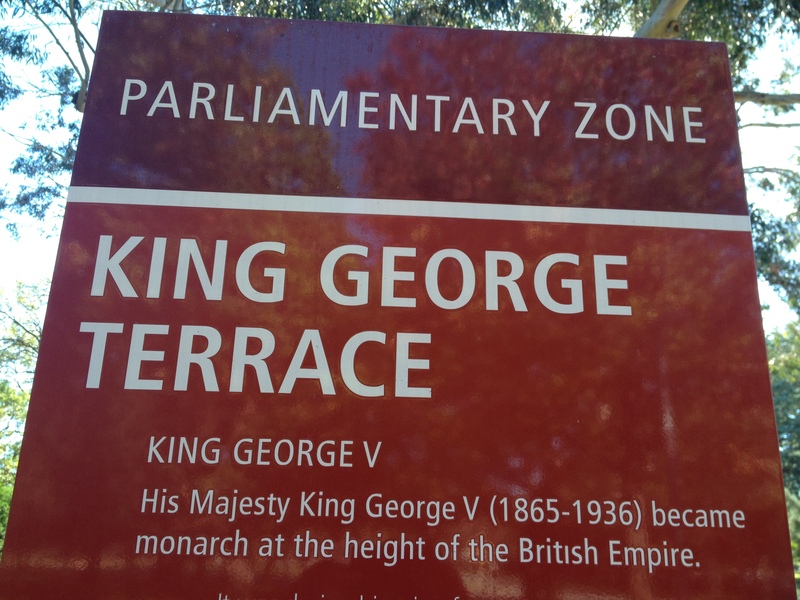 Know that we have missed our window to get in for Prince William’s Parliament House address. So near, yet so far. 19. After lunch, debate whether it’s better to catch royals on the way out of Parliament House, or catch them on the way in to their next engagement at the National Portrait Gallery. 20. 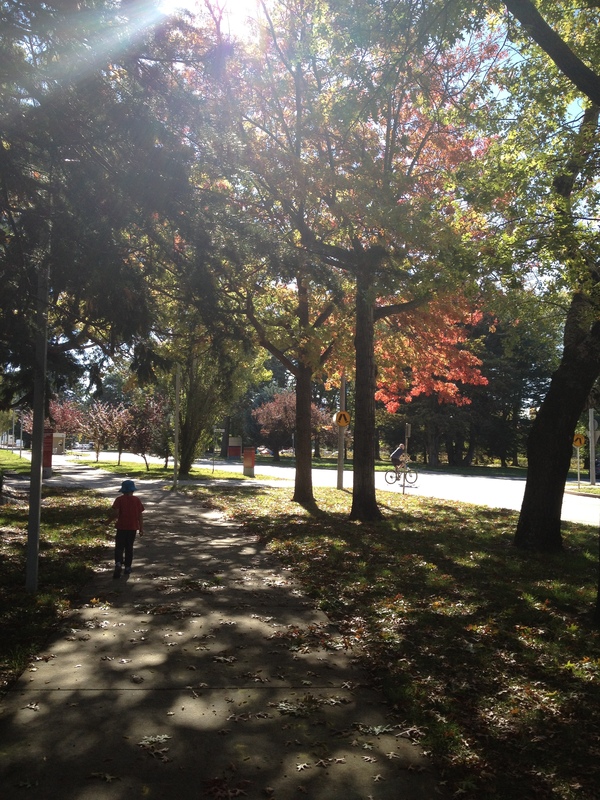 Decide on the latter and walk 20 minutes through copious autumn leaves. 21. Crawl through copious autumn leaves looking for Teenage Mutant Ninja Turtle sword the size of a pin, dropped by Spider Boy. 22. Bribe Spider Boy with the promise of a new Teenage Mutant Ninja Turtle figure (and accompanying pin-size ninja weapon) if he’ll just NOT complain and let me wait for royals. 23. Be a bit surprised yet vaguely amused by Spider Boy’s “Why do you have to be such a fan, can’t you just control yourself” comment. Looking for a tiny ninja sword in a haystack. 24. 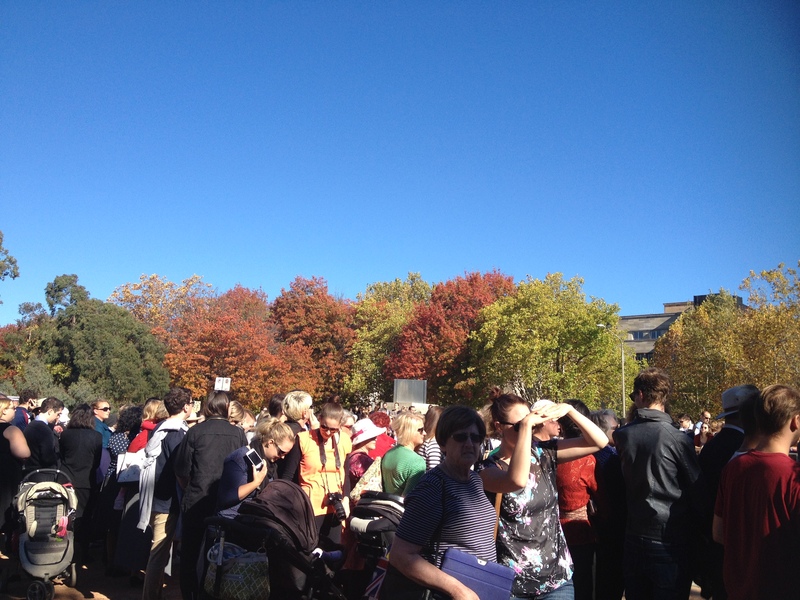 Feel uplifted and excited by nice orderly Canberra crowd outside the National Portrait Gallery. 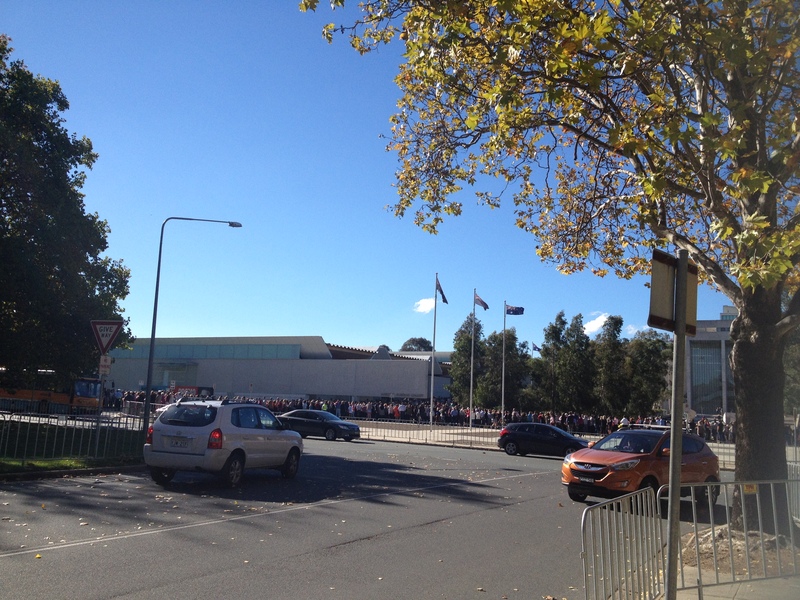 The sight of the nice, orderly Canberra crowd was uplifting. 25. 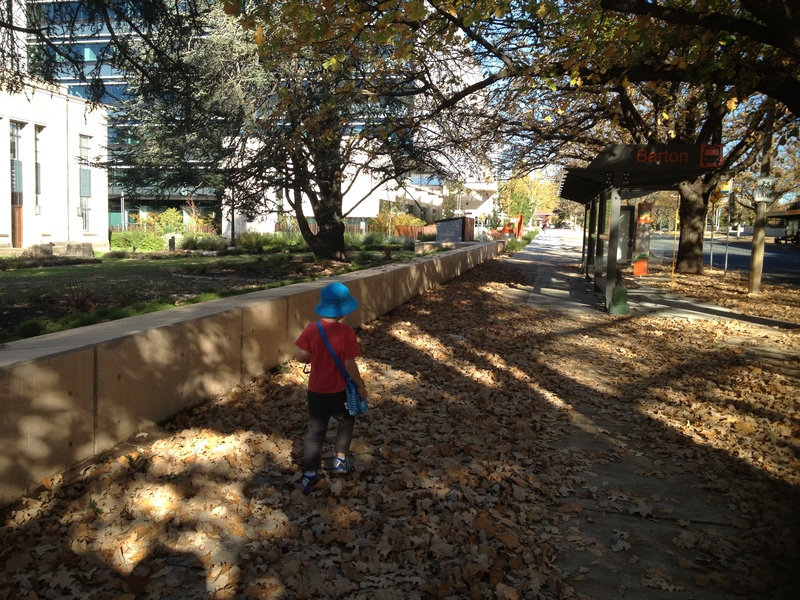 Feel uplifted and excited by the sight of autumn leaves fluttering against the blue sky like earth-tone fairies. 26. Feel disappointed when, after speaking to a Federal Police officer I realise we are waiting at the royals’ intended exit end, not the entrance end, and no more people are allowed at the entrance end. The people there have been waiting since 6.30am. 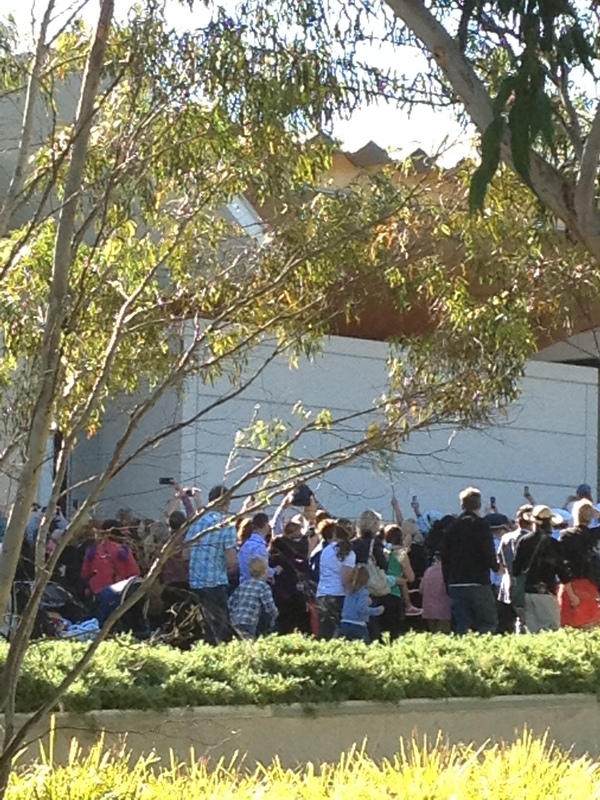 27. feel momentarily excited when I hear the royals arrive, thanks to people screaming. I turn to see the crowd holding their phones over their heads, snapping away. So near, yet so far. 28. Nod in agreement as the woman standing next to me says, “Better to watch it on TV”. 30. Realise that’s what you get for being blasé and turning up at 2.16pm for a 2.25pm royal entrance. 31. Ask police officer when they are due out and am told told 20 minutes, yet read on Canberra Times website on my phone that it’s 1 hour 20 minutes, not 20 minutes. Be told a different time by yet another police officer and realise it’s still a good 30 minutes away that they’re due to exit. 32. Realise that if we waited there’s no guarantee we would see even a flash of William’s pearly whites though the dark glass of the royal car as it glides past. 33. Feel sorry for Spider Boy that he’s lost his tiny ninja sword. Feel mean that I didn’t spend longer looking for it (“Quick, we’ll miss the royals!” etc) and realise that if I’m going to get groceries and another ninja sword before I have to be back in the Parliamentary zone later, we really should leave now, as it’s a good 20 minute walk to car (lent to us for the rest of the afternoon by Spider Boy’s dad). 34. Skip the royals’ Anzac Day services the next day because rain, cold, early, transport, blah, blah, blah. 35. Watch from couch with hot coffee and see everything. 36. 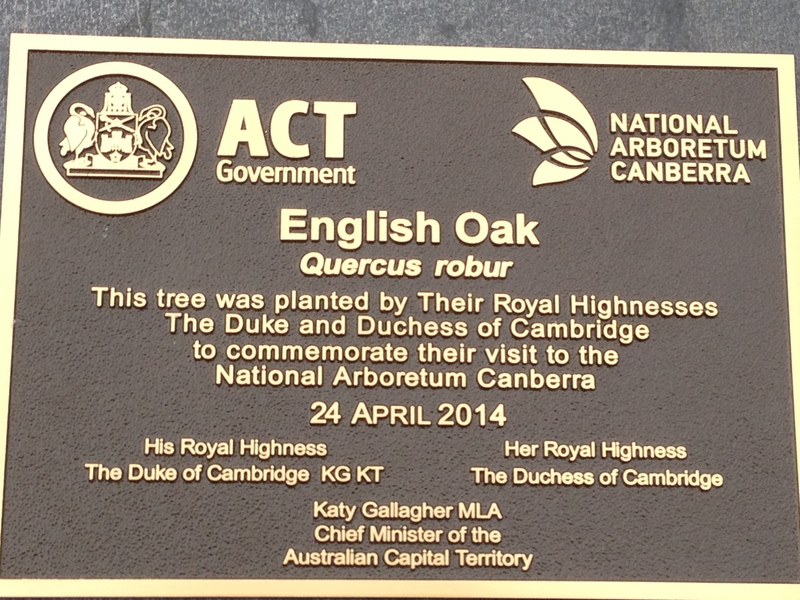 Attend National Arboretum 28 hours after royals were there. 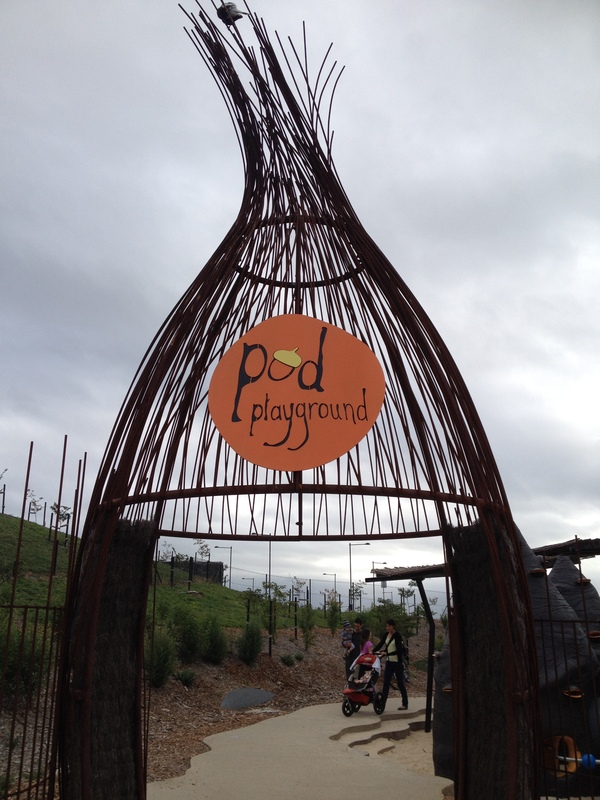 Watch Spider Boy play in giant acorns in the Pod playground. 37. Marvel at the English oak tree Kate planted there just a day before. 38. Get home and marvel at how I forgot to take a selfie with the tree Kate planted. And I call myself a royal watcher. *If you’re in a car. Not waiting for a bus. And then another bus. That’s very funny! I can relate too! !